Don Nose in the future home of the Go For Broke National Education Center, the historic Nishi Hongwanji Buddhist Temple building in Little Tokyo. 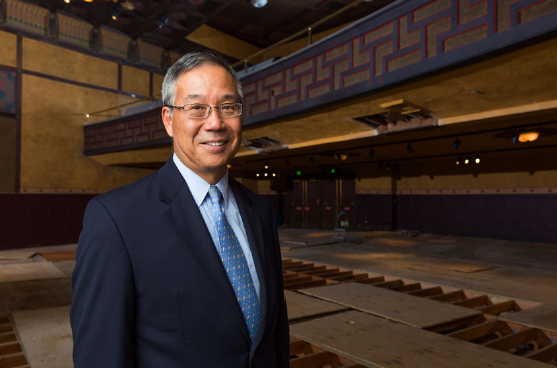 Don Nose, who has served as president of the Go For Broke National Education Center since 2010, will step down in June 2016, following the opening of the new Education Center in Little Tokyo. “When I started 4 1/2 years ago, it was about getting the center built. We had a vision to get that done. We’ve pursued that vision with great vigor and we’re now on the doorstep of that happening,” Nose said in an interview with The Rafu. A national search will be conducted for a new president. Nose explained that he would be participating with the search and that he will remain with Go For Broke through the transition. “This organization is near and dear to my heart. The kinships I’ve developed with veterans and widows, they’ve made me feel like a member of the family. There is always going to be a part of me that will do whatever I can to make sure Go For Broke is successful,” Nose said. Work continues on the Education Center, which will be located in Little Tokyo on First Street in the Japanese American National Museum’s historic building, the former home of Nishi Hongwanji Buddhist Temple. Go For Broke signed a 20-year lease with JANM for the building, which is located directly across from the museum and adjacent to the Go For Broke Memorial. Bill Seki, chairman of the Go For Broke board, praised Nose for implementing a five-year plan that will see the organization make its long anticipated move from Torrance to a permanent headquarters in Little Tokyo. “Don Nose has been a driving force for GFBNEC. His diligent work over the past five years has grown the organization from one that honored the contributions of our JA World War II vets, to one that takes their message of courage and applies it to the challenges we all face today. We are grateful for his contributions and leadership,” Seki said. The new Education Center will feature an immersive exhibition that will bring the stories of Nisei World War II veterans to a broader audience. “The challenge as we develop the exhibition is to make it more widely accessible. That’s really the change that’s happening, not so historically focused, but present day and future focused,” Nose said. In addition, the organization has begun work on its National Digital Archives of Japanese American Military Service, which will be the definitive collection of oral histories, photos and documents of Japanese American servicemen and women, beginning with those of the Nisei soldiers of World War II. Nose said the opening of the Education Center will raise the national profile of Go For Broke in a way that will create potential to reach a larger audience.